Welcome to Jack In The Box Party Rentals! Rentals range from popcorn machines to tents, tables, chairs, and dishes. Retail sales of plates, napkins, confetti, place cards, handmade crafts, and balloons for all occasions. Complete line of wedding supplies and decorations for sale and rent. Drop in to see our ever expanding line of D I Y decor. Assisting brides in wedding planning for over 20 years. 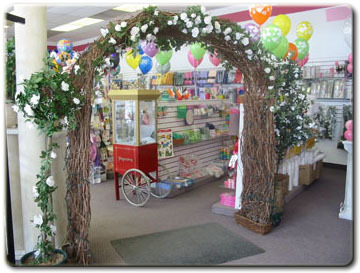 We have the best selection of wedding and event supplies in the Kawarthas.